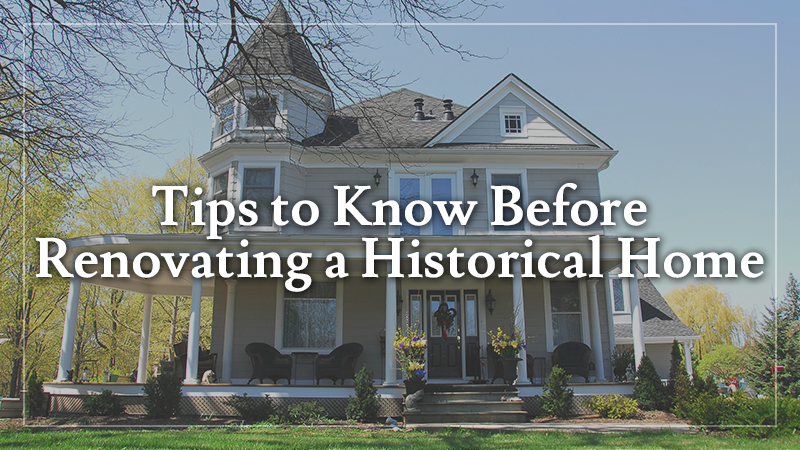 Renovating a historical home can be an exciting and liberating adventure, but there are some important things you should consider before you begin to renovate. Maintaining the historic integrity of the house is probably one of your main concerns, but there is more than one way to accomplish that. To begin with, you must decide whether you want to rehabilitate or restore, as this will guide your decisions going forward. How do you restore a historical home? Restoring a historic home means returning the home to its original state. This typically involves restoring both the interior and exterior of the home using only materials and items available during the particular time period when the original home was built. A restored historical home should look and feel like you are stepping back in time to the date when the home was built. Restoring a historical home is typically more labor intensive and costly than rehabilitating a historical home, but the result is an authentic home that celebrates its history. What is rehabilitating a historical home? Rehabilitating the home is more common than restoring it, as rehabilitating means to make the home functional for modern living while preserving architectural and historic features. When rehabilitating a home, the homeowner typically includes modern structures, such as plumbing and electricity, to make the home more efficient, while preserving wood, masonry and other architectural features of the home. 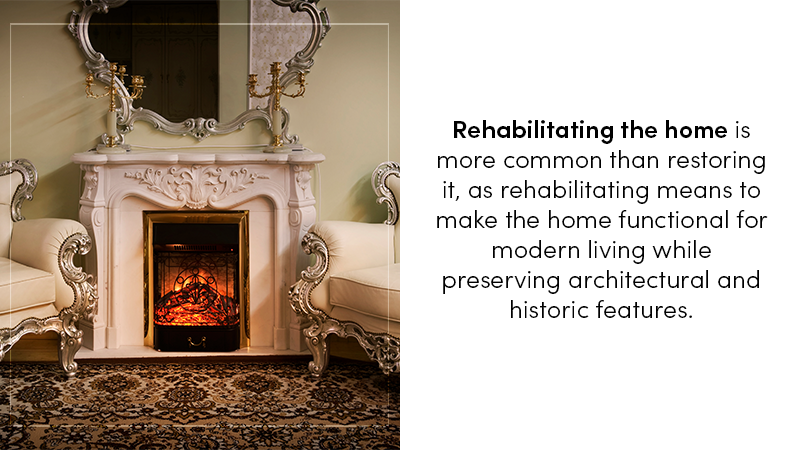 For example, the original fireplaces may be restored to maintain the appearance of the original home, while central heating may be added to make the home functional for modern-day living. How do you choose between restoring and rehabilitating? The choice between restoring and rehabilitating a home is a personal one. If you intend to use the home as a residence, rehabilitating the home is the best choice. If you plan to use the home as part of a historic demonstration or as an educational display, restoring it to its original period may be a better choice. Some considerations include the amount of time and maintenance the home will require, the cost of rehabilitating or restoring the home and whether you are prepared to live with the seeming inconveniences of a historic home. You will need the expertise and experience of professional contractors to help you restore or rehabilitate your historic home. Choose a contractor with a track record of success and that is known for reliability and quality. L & L Contracting is both professional and reliable with a proven track record for renovating historic homes. In fact, L & L Contractors worked with HGTV’s Listed Sisters to restore two historic homes recently. The restoration process was filmed and will be aired in two episodes. Episode one aired July 12 at 10 P.M. CST, and episode two will air August 9 at 10 P.M. A viewing party and open house is scheduled for Friday, August 11, 6:00-9:00 P.M., at L & L Contractors, 25 S. Public Square, Murfreesboro, TN 37130. Stop by and get a firsthand look at what L & L Contracting can do for you, or contact us today to learn more about how we can help you.